Christmas Carols are playing in airports. Staff are wearing their Santa hats. Everyone’s infused with Christmas spirit. Except, a woman says, Spirit Airlines. 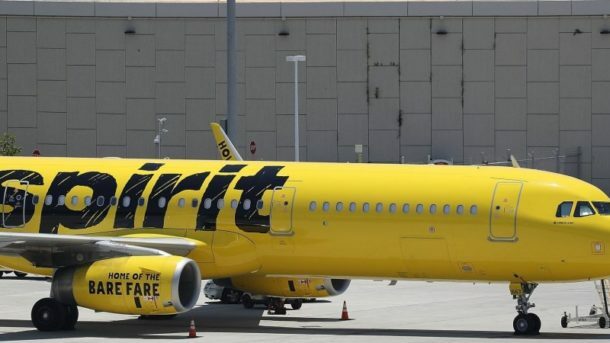 As KPRC2 reports, this unnamed mom says she was sitting in a Spirit Airlines plane at Houston airport, on her way to New York. The flight, however, was delayed. The woman was traveling with her elderly parents, who aren’t in the best of health, and her two-year-old son. Children aren’t always tolerant of flight delays. Her son was hungry. So she says she unbuckled her son’s seatbelt and began to breastfeed him. It was then, she says, that a flight attendant asked her to buckle him up again. The mom says she asked for just a few minutes more to finish the feeding. Finally, she says, she buckled him up. This appears to have been too late. The flight attendant had already alerted the captain and the woman was removed from the flight. Some might focus on the words “at this point” and see a classic airline situation being replayed. All too often, cabin crew are told to behave like law enforcement and when their instructions are not immediately obeyed, the reaction is absolute. If the woman’s story is accurate — and with some stories, the ifs can be large — would anyone have been harmed by the fact that she continued to breastfeed a few more minutes? What was left unclear in the woman’s story is whether, for example, the plane was still stationary. Moreover, we don’t really know the tenor of the initial conversation between her and the flight attendant. I suspect it wasn’t entirely friendly. But here’s a video of what happened after she was removed. Here, we have to note the subtleties. Hark at the sniff of arrogance from this member of (presumably) the Spirit ground crew. “If this happened to your family, would you…?” the mom asks. “It wouldn’t happen to my family,” he interrupts, just a touch holier than she is. And then there’s a second video. This member of the ground crew says he’d listened to what the cabin crew had told him. It seems they’d told him the child wasn’t in his seat. Could this be because, well, he was being breastfed at the time? In fact, what part did the breastfeeding play in the unfolding of this scenario? The mom is upset and asks for the crew to come out and explain why she’d been thrown off. “That not how it works,” replies the man with the exemplary family. He’s right. It seems too often to work with the airline issuing orders and passengers having to comply or else. Which may often be correct, but not always. I contacted Spirit to ask for its side of the tale. The airline insists that this truly was a safety issue. “A passenger was removed from flight 712 after refusing to comply with crew instructions several times during taxi to runway and safety briefing. To protect the safety of our guests and crew, FAA regulations and airline policies require all passengers to stay seated and buckled during takeoff and landing. We apologize for any inconvenience to our guests. As a courtesy, we’ve issued a full refund to the passenger in question,” a Spirit spokesman told me. Once these things reach the media, they take on a life of their own. But did a 2-year-old and his mom really threaten the safety of the guests and crew? Or was this just another sad day for customer service? Oh, and if you’re wondering how long the plane was delayed, it departed 4 hours and 20 minutes late.